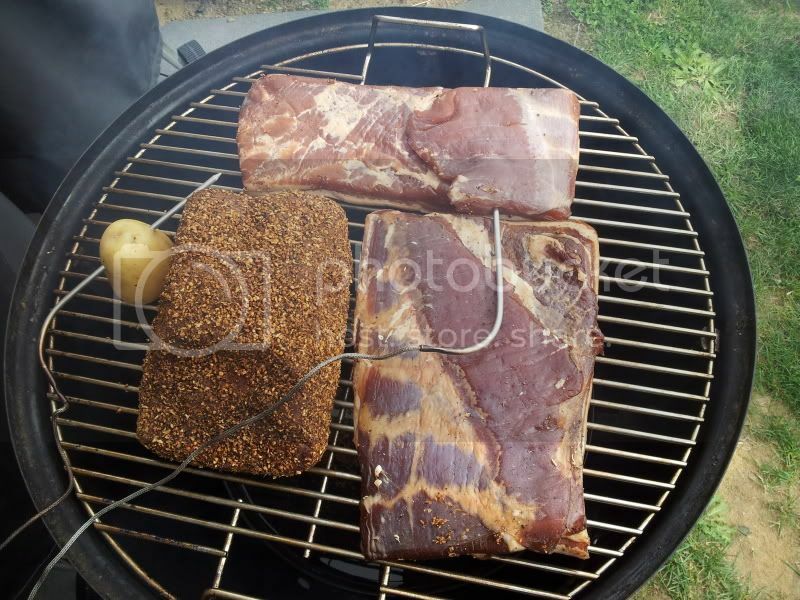 Bacon seems to be coming along nicely, hopefully I'll be smoking it on Sunday. Going to start mine off this weekend with an eye to smoking it the following week. I never fry bacon. It's better grilled. On a piece of tinfoil or in a pan. 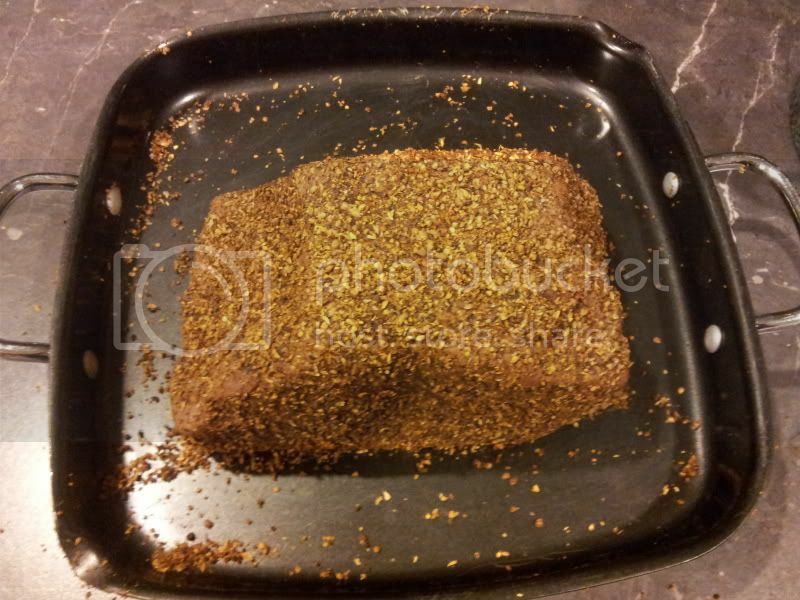 Then, once it's all crispy like in your picture tip the fat off into a container. I can tell you I don't have any water in it by then, it steams off when you grill it, and all that is left is pure fat. So, I can't be bothered going through all that, and it's too expensive anyway. You must be a real exciting and fun person to be around. not sure why he is posting. ob doesn't understand hobbies..and how one can be fun for one doesn't mean it is for another. just tried the first of the bacon. Unfortunately I didn't read the instructions so I won't be smoking it today as I didn't take it out of the bags earlier. Maybe I'll skive off on tuesday and smoke it then. If using a knife to slice it's easier to take the rind off yea and that's what I did with the first lot I did. It doesn't really matter if you take it off pre or post cure but if doing it pre cure you might not need to leave it in the bag as long since the cure will penetrate from both top and bottom, start checking the firmness after the 5th day for example. The other option is to chat up your local deli owner and ask to use their electric slicer (i suggest bribing them with bacon). I did this with the last lot and it was awesome, just make sure it's near frozen (transport it in a chilli bin to keep it that way) when doing it otherwise it won't slice nicely. I asked the local butcher and he was hesitant and couldn't do it. As they can get landed with a $50,000 fine. Sliced my first lot up this morning and had it with some scrambled eggs, was awesome, even un-smoked. I found it pretty easy with the skin on, but used a brand new knife, just glided through it. 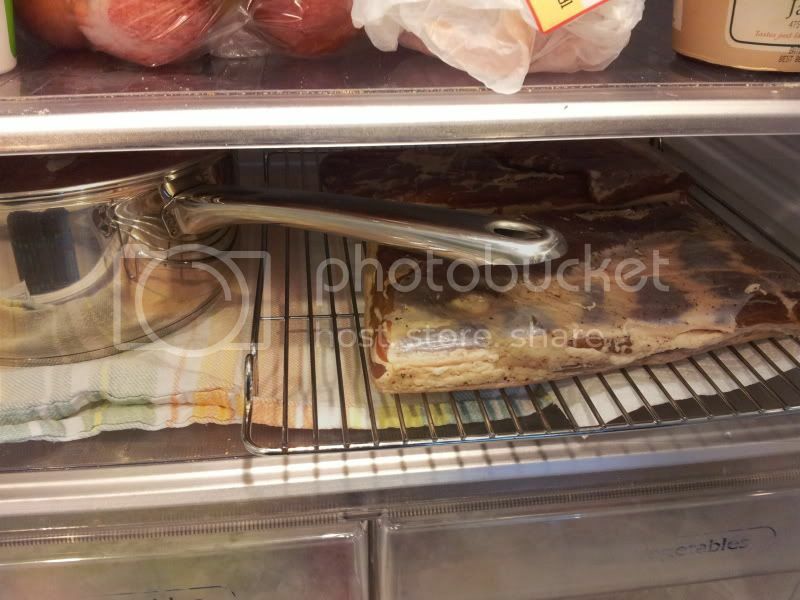 The butcher might not be able too, they may be under the same restriction as the supermarkets which aren't allowed to cut uncooked meat on them. A deli that slices it's own salami/prosciutto etc is your best bet. How long will the non smoked variant last for in a sealed container? Depends if cut or not probably, but a couple of weeks i'd expect. As long as it doesn't look/smell bad it should still be fine though. None of mines lasted long enough to put it to the test. Once I cut it up I just wrap up bunches in glad wrap and freeze, then you only pull out what you'll use in short order. 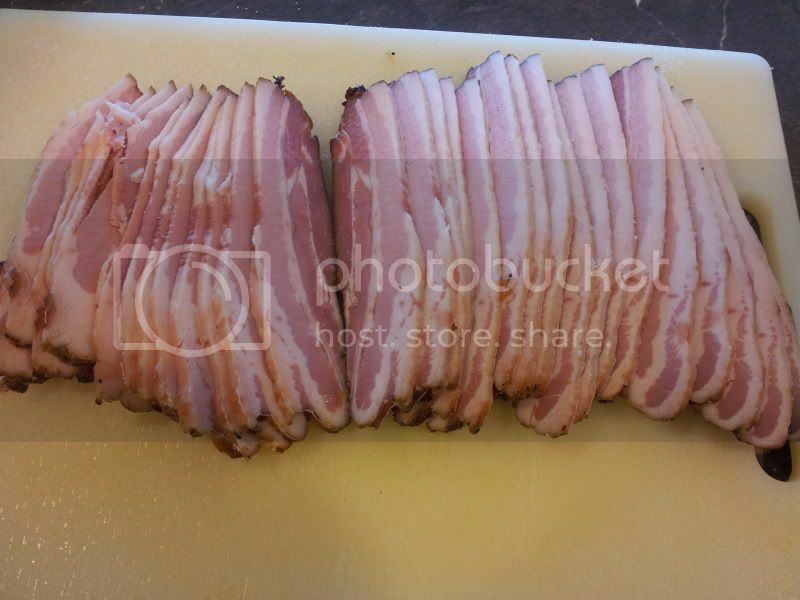 Smoked the bacon today. Definitely turns it up to 11. Had a few problems keeping the smoker cool enough, spent most of the time in the low - mid 30's. So I'm not sure if I can call it cold smoked. Probably not helped by the fact it was an awesome sunny day in Christchurch. 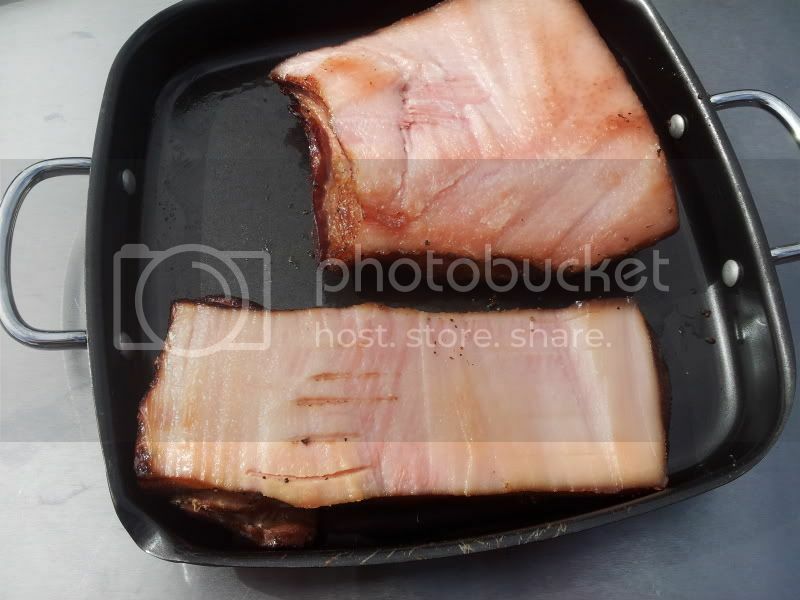 Pork belly $10.99 at Pak'n'Save at the moment. 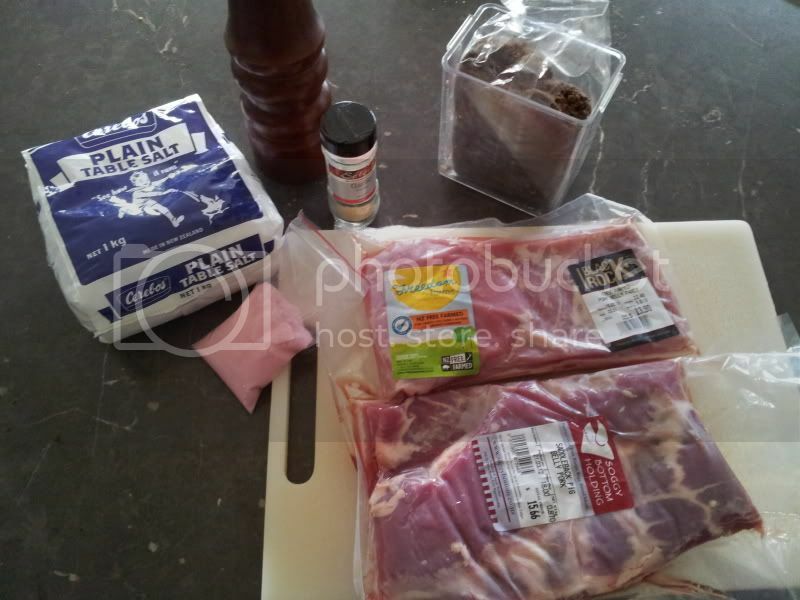 Thats 2 complete sides of pig (incl ribs), the top side was so big (widthways) that even dividing it into 3 pieces it wasn't going to fit into my plastic bags. Had to cut a number of sections down the middle to be able to bag them. 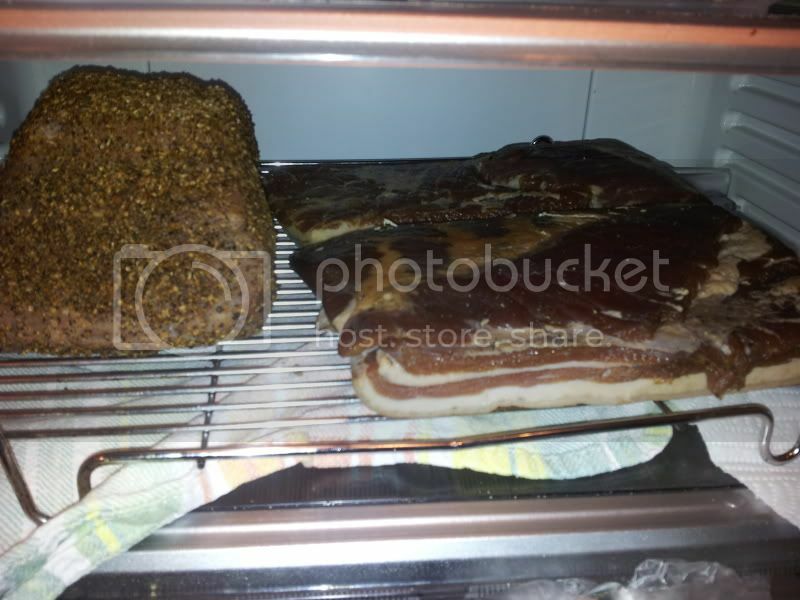 So for about $110 and less than 45 minutes time to process i've got 9.3 kilos (after boning) of bacon curing in the fridge. 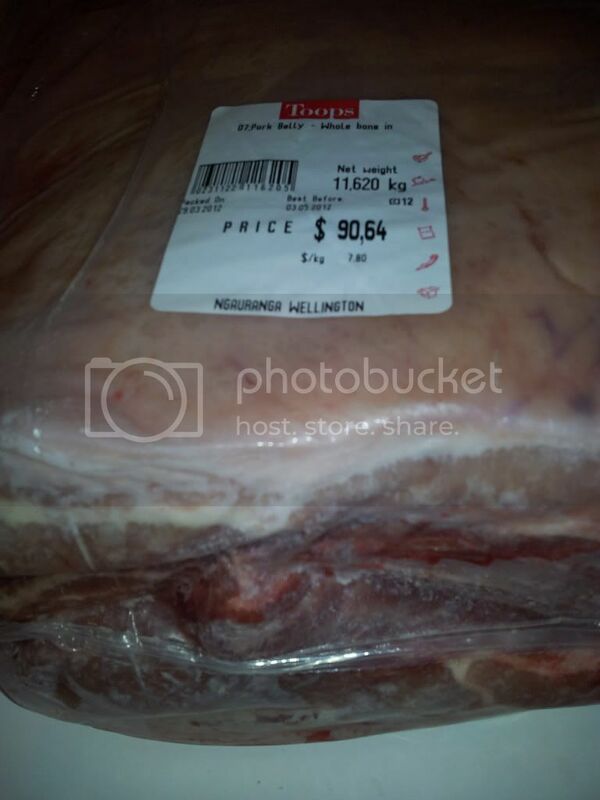 I'd sold 1kg for $25 before i'd even bought the pork. 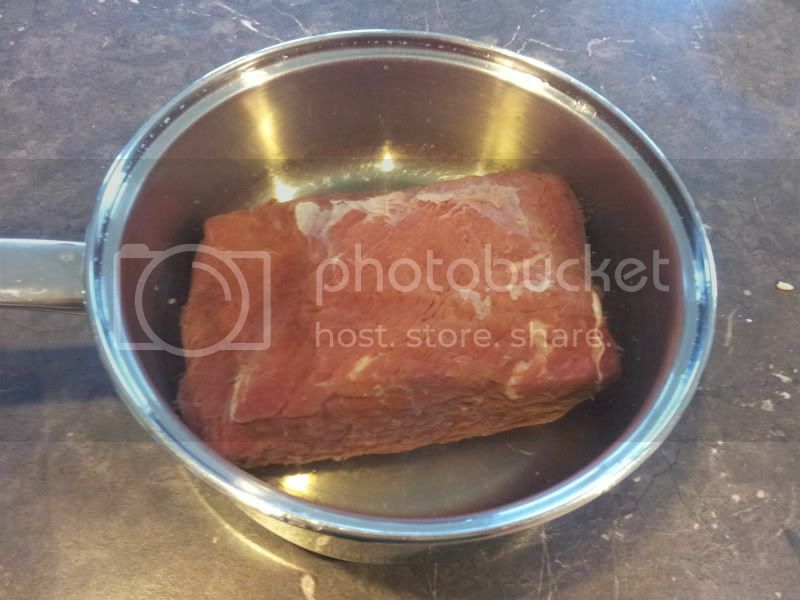 My family bought me one of these, i'm going to remove the shelves and hang the meat from the top on fishing line / SS hooks and use it as a pest proof drying tent so I can hang the meat for several days before smoking. Wow! That's a huge slab! With the ribs attached you say? Would love to find something like that around. Never heard of Toops, don't think they are in Hamiltron. Post some more pics of it being cut up if you can mate. Would be keen to see what sort of ribs you get off them. I guess you'd have to sacrifice some belly meat and potential bacon if you wanted to leave a lot of meat on the ribs. That pantry as a place to hang and dry looks interesting too. Will you have to refrigerate it at all? 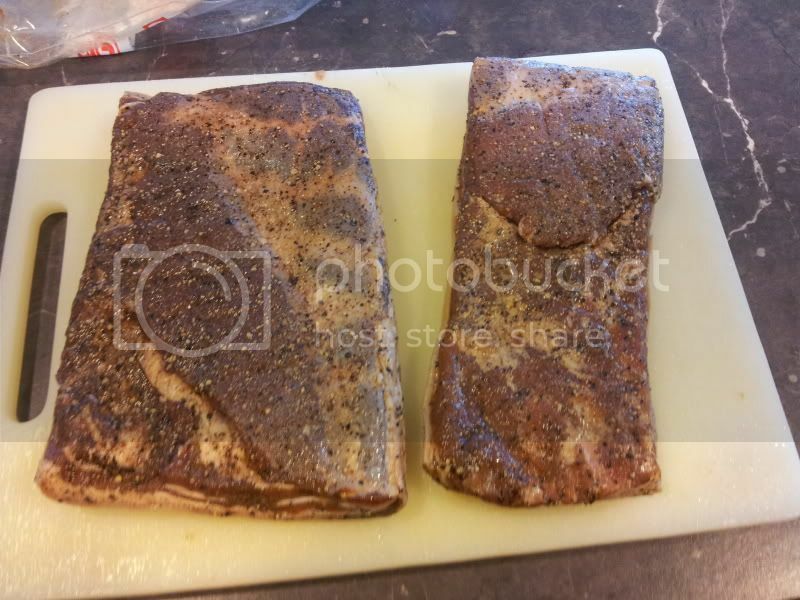 Had a massive session today doing my bacon and pastrami and took heaps of pics. I'll sort them up and do a big post tomorrow. Toops are in most cities surely? It just a wholesale place business can purchase from. You need a registered business to get a toops card. $180~ or whatever it is these days to register a business. Pays for itself from the cheap bulk stuff. Yea I think Toops are in most places, but due to them only serving food service (or related) businesses most people don't get to buy from one unless you know someone with a card. The one I used belongs to a friends rugby club. It's definitely an either/or proposition between meaty ribs and bacon yeild. 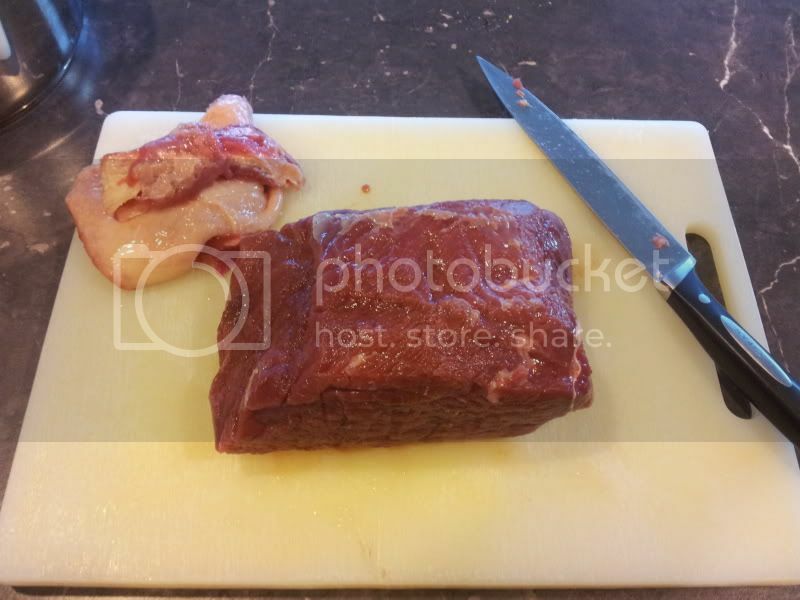 You do come away with perfectly cookable spare ribs, with meat between the ribs, but by using a sharp boning knife you can leave most of the meat on the belly with little trouble. I'm refrigerating it during the curing process, once it's cured I should be able to hang it in that pantry without refrigeration. This lot will probably get more than 7 days in the fridge since it's a bit thicker i'll likely check it on the 8th day and it may need another day beyond that. After that the only potential for spoilage should come from surface growth (be it bacterial or spore) but the combination of the cure and the drying should prevent that problem. In theory the moment you've finished rubbing it down with cure it's safe to leave unrefrigerated, that's how it used to be done after all, but that's sailing a little close to the wind for my liking. Thanks Sign. I have been to Gilmours and have a card with them but haven't been for ages. (like 2 years). That sounds awesome Deadm3at, you'll be swimming in Bacon! 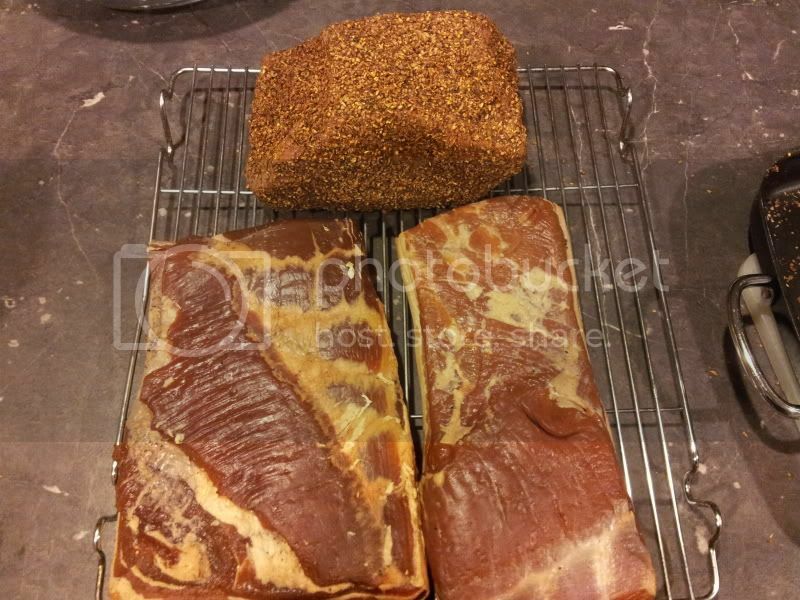 Ok, incoming large post of Bacon & Pastrami goodness. 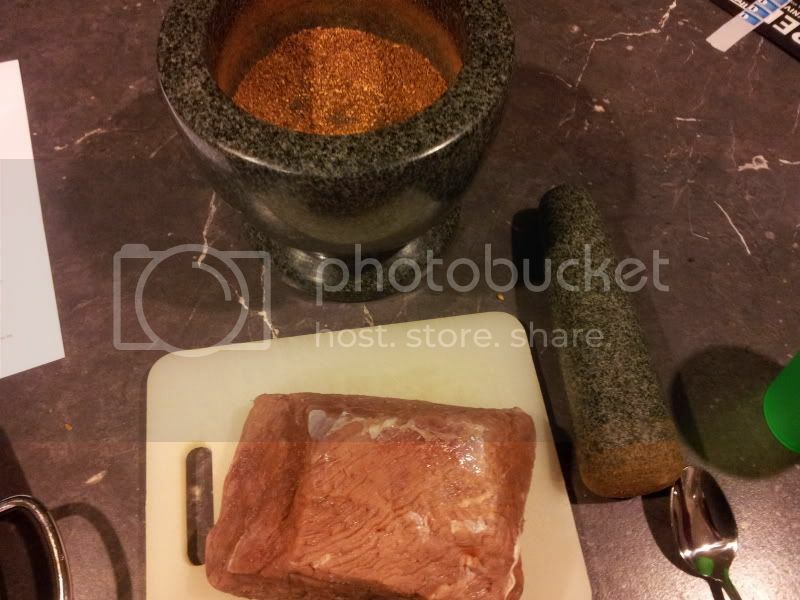 TLDR version: Made meaty goodness, was nice, see pics. 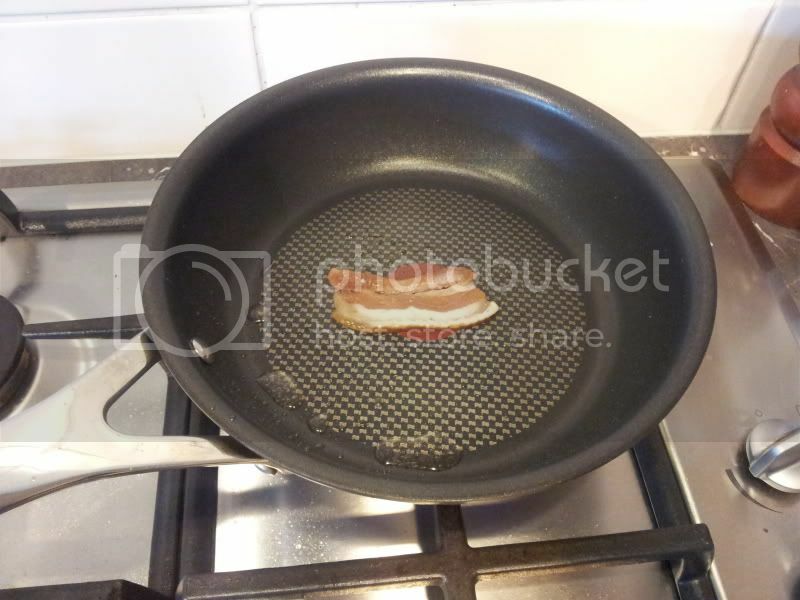 So inspired by Deadm3at in this thread and my long time back of the mind thought of “I really must give making bacon a go at some stage”, I’ve got my act together and done it. 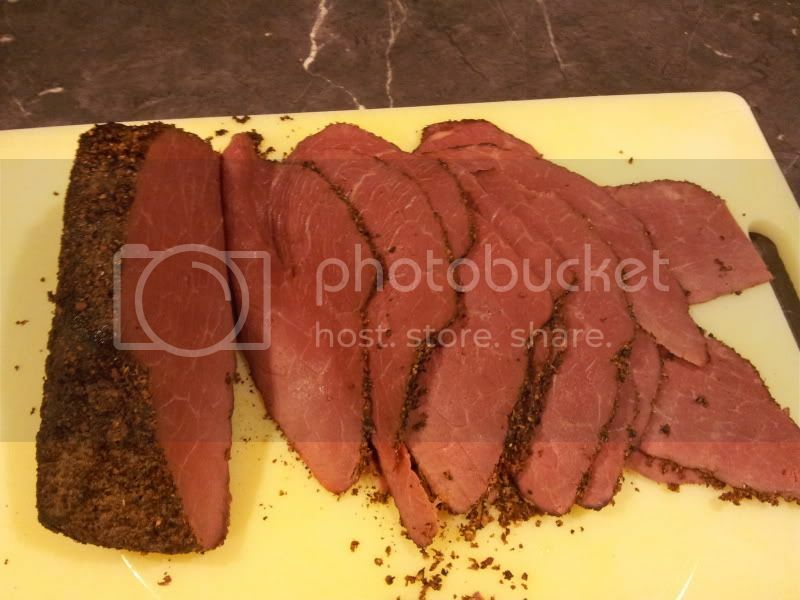 I also enjoy pastrami, yet detest corned beef, and recently found out you can make the former from the latter, so decided to put a piece of corned beef that was at the bottom of the freezer with five of its buddies through the test. I’m going to share the full process in chronological order, with lots of pics. 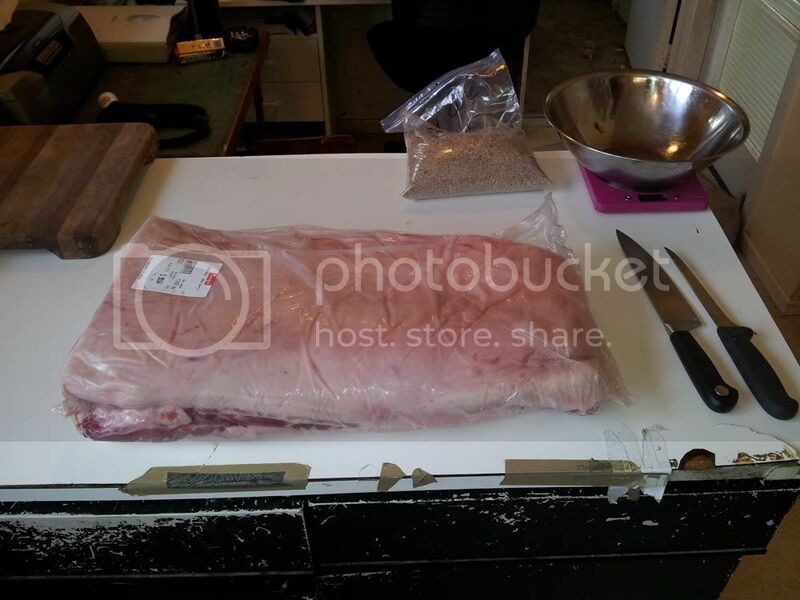 Started last weekend on Sunday, after previously acquiring some Prague Powder from TM and liberating the small piece of Freedom Farms pork belly from my freezer the day before and also adding some pork belly I got at the local farmers market on Sat morning. Meat unpacked and washed, not much trimming needed and no bone. I had also acquired of TM a handy set of digital scales to do small measurements to 0.1g accuracy. 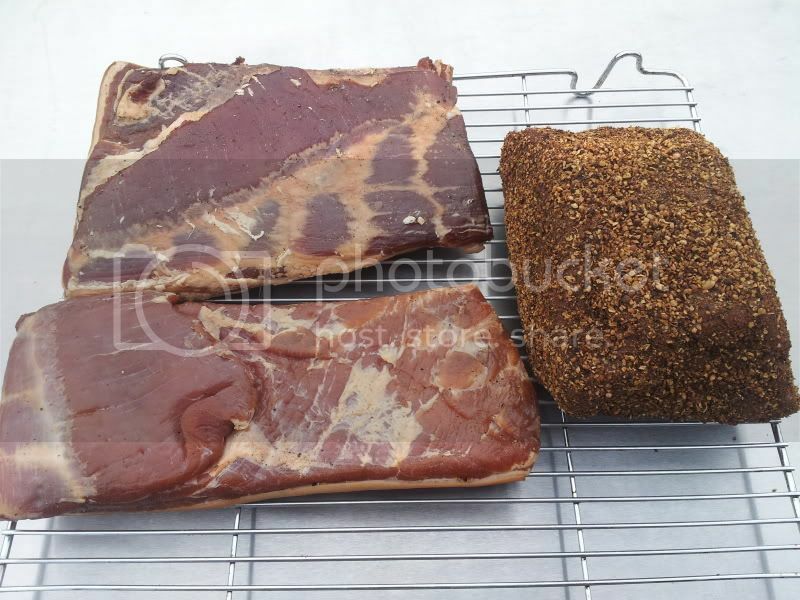 The one on the left, despite being thicker than the Freedom Farms one, was ‘stiffer’ and felt more ‘cured’. Wondered if this might have been due to the other being frozen…? Perhaps something to avoid in the future. Very nice! 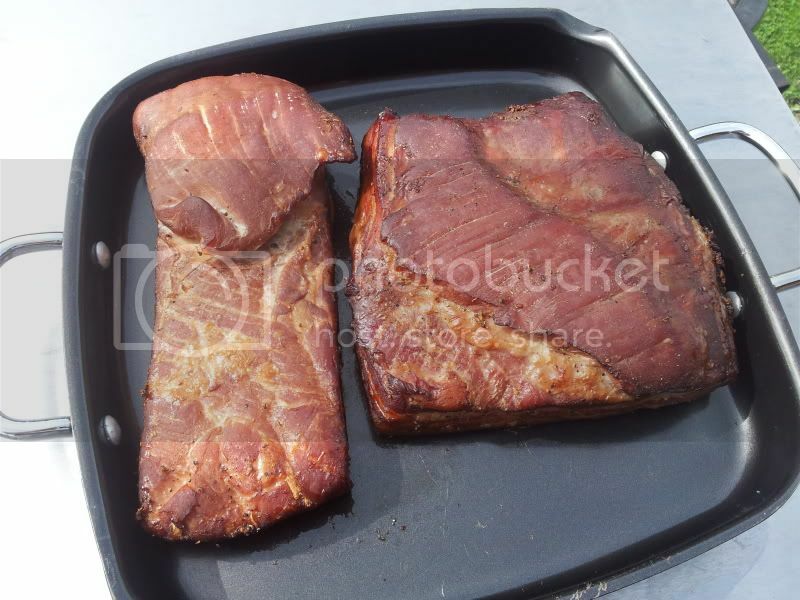 Quite meaty/porky, a bit salty but not too bad, nice and crispy. Even got the thumbs up from the kids and the dubious wife who was convinced I was going to poison the lot of us! 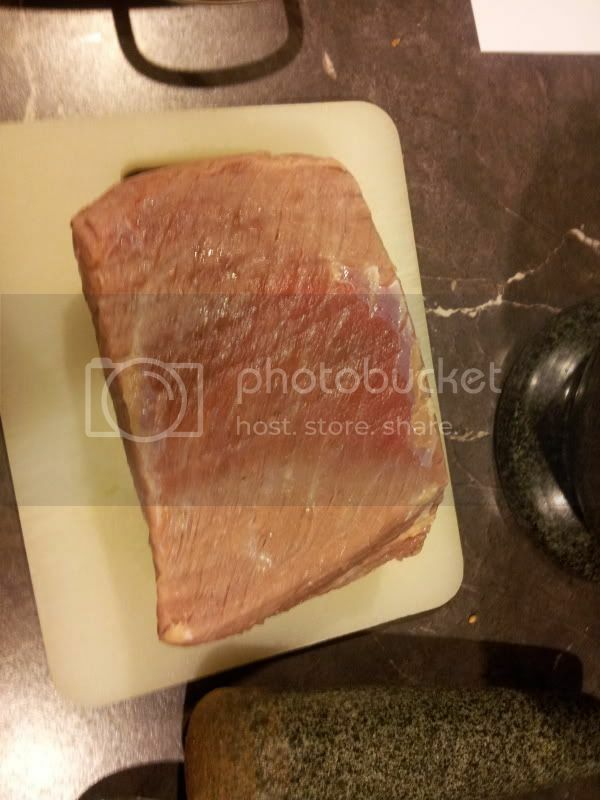 At this time I also started prepping the corned beef, which was to become pastrami. 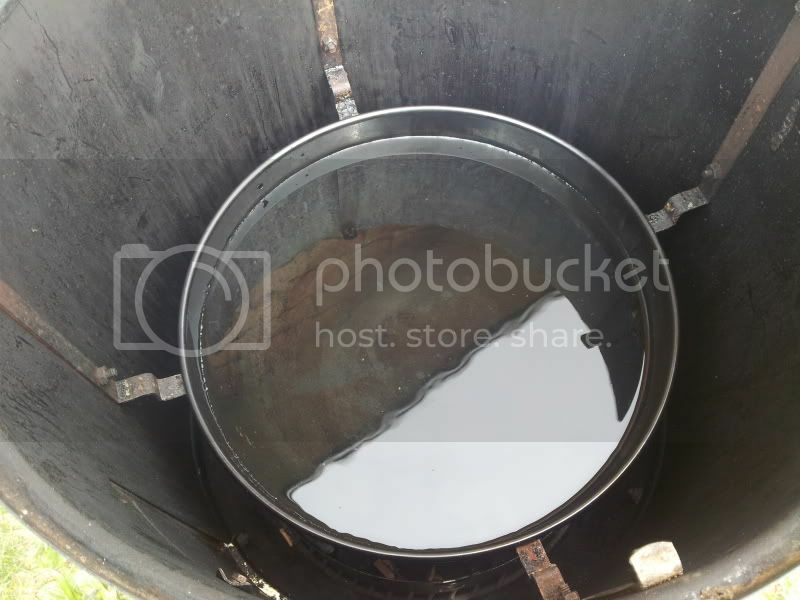 The water was to be changed every 2 hours (approx) for the day. 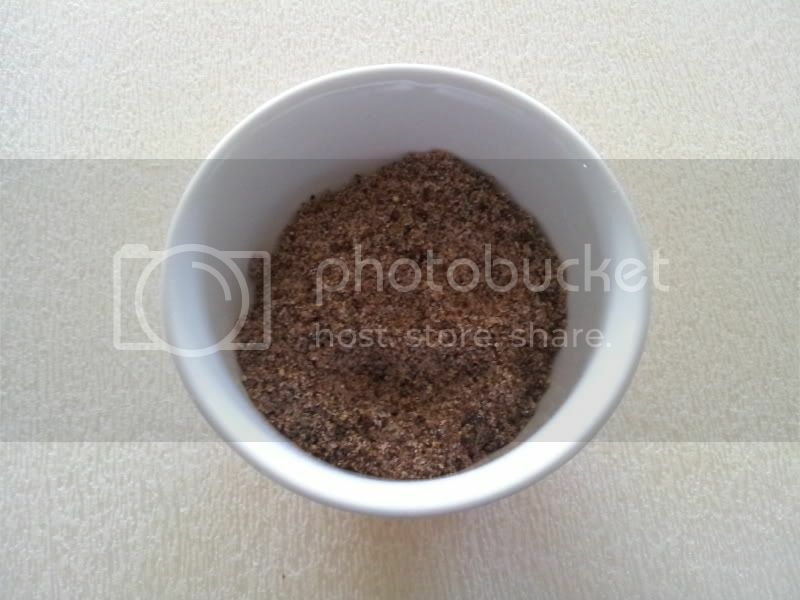 This draws the salt out of the corned beef. 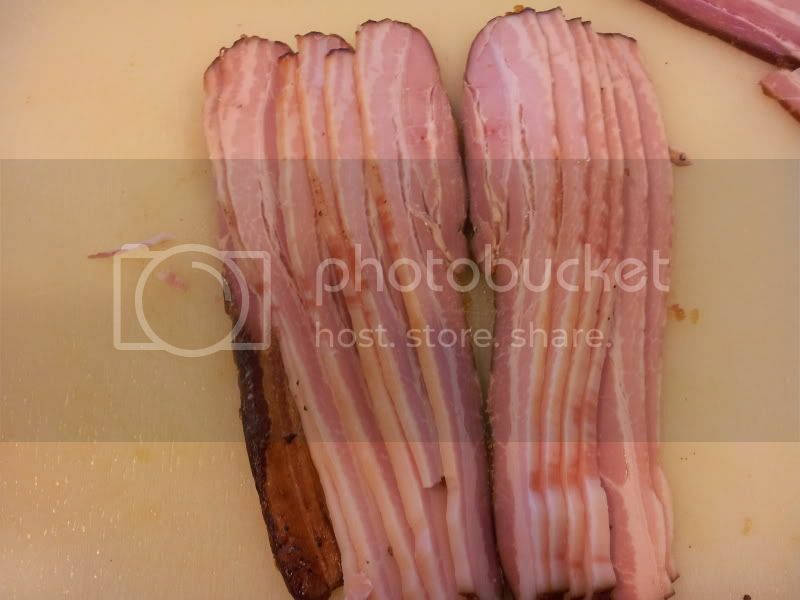 Pic above is from the bottom of the meat and it appears redder where it was sitting, perhaps rotation was something to think on for next time. 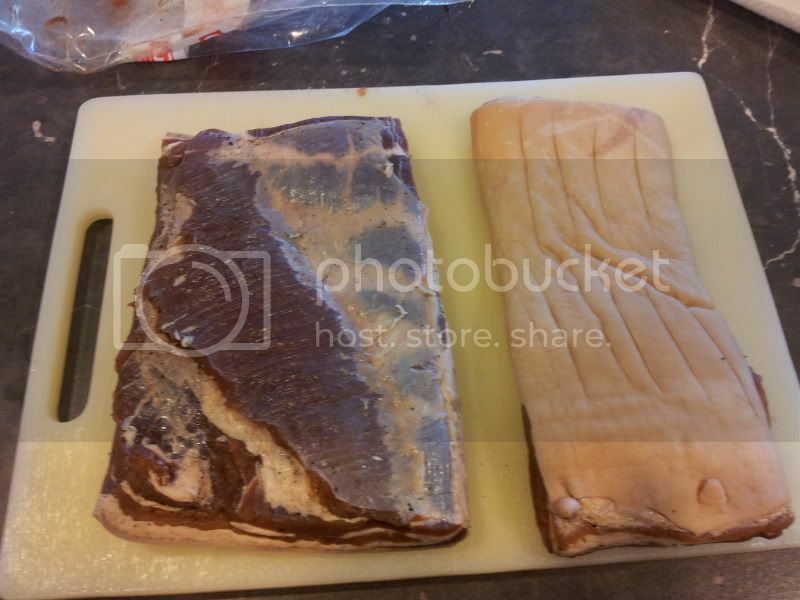 Bacon had a nice tacky pellicle and the beef looked dry and ready. Set up the WSM for smoking. 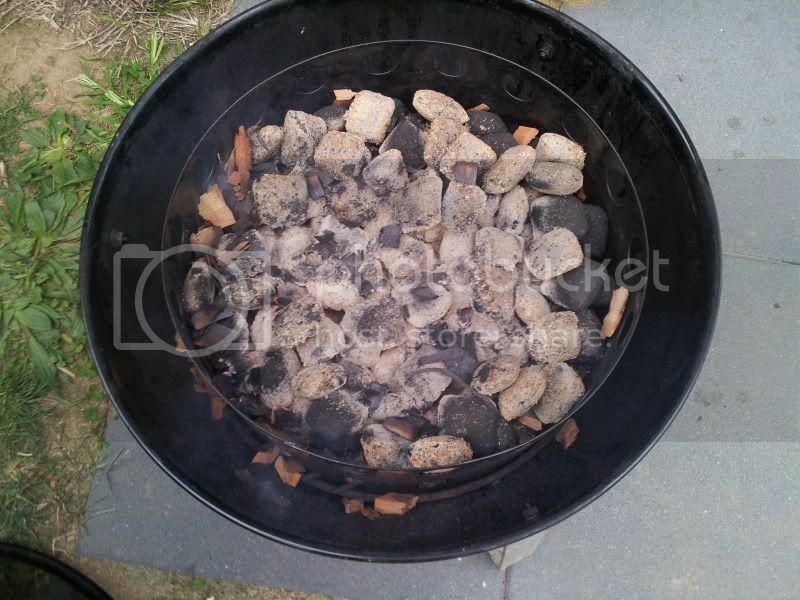 Using leftover coals from the last cook and a few fresh unlit ones on top. Sprinkled liberally with cherry woodchips. This is known as the ‘minion method’. 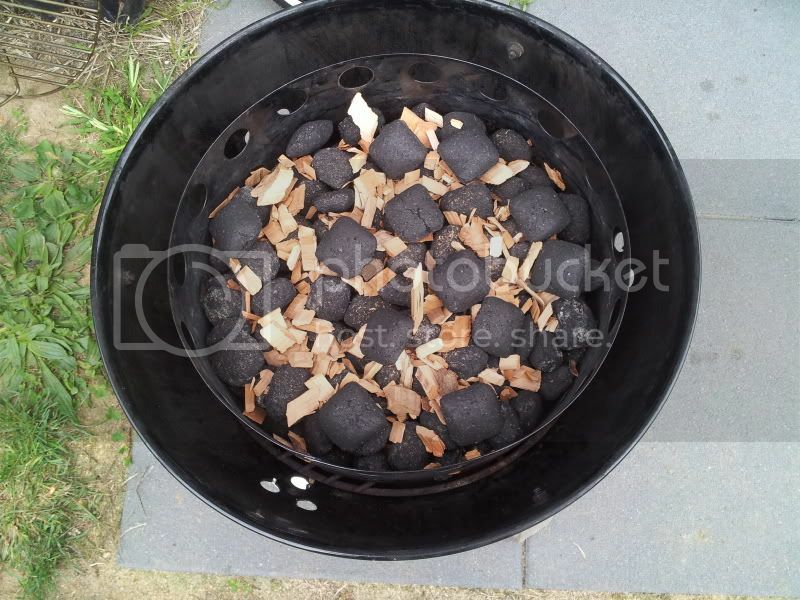 Lid on and a handful of additional soaked cherry woodchips put on the coals. 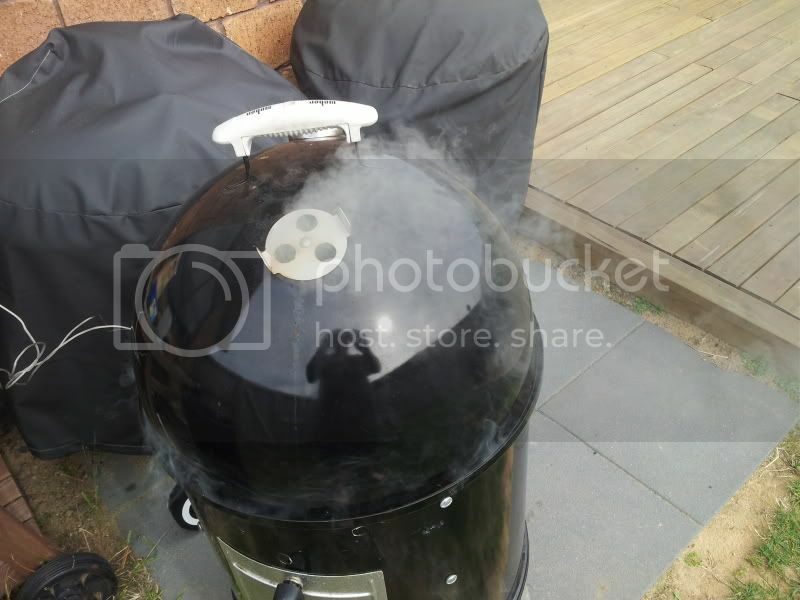 Smoking away nicely! 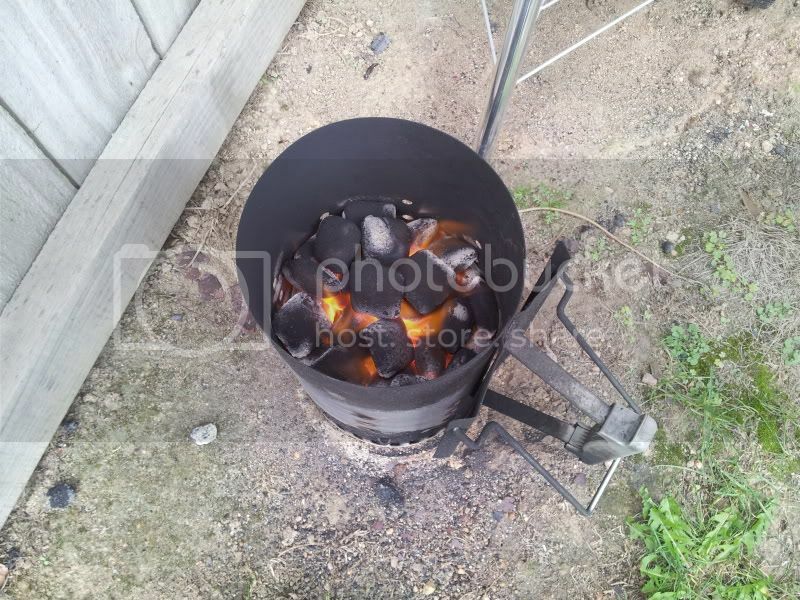 In the first hour or so I was putting more handfuls of soaked chips on to keep the smoke flowing hard. I had the vents almost fully closed and was aiming for a cooking temp of around 190f. For the first hour or so it was under 200f and then started to climb to about 210f, mainly because I was opening the door to put in woodchips. 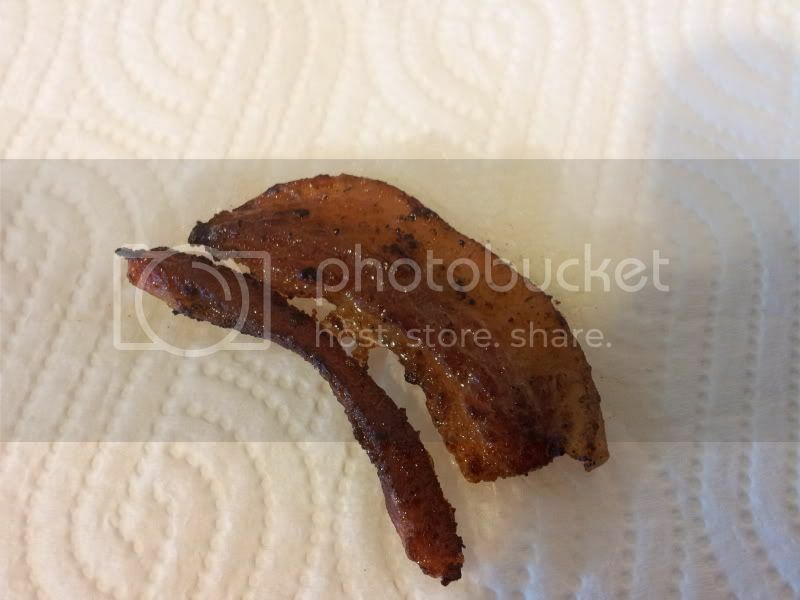 The first smaller piece of bacon came off at an internal temp of 163f after 1hr 40m and the second after 2hrs came off at the same temp. They seemed to stall at 160f for quite a while. They then went into the fridge to cool and firm up for carving. Meanwhile the pastrami was still chugging away. It hit 160f at the 2.5hr mark and sat there. I was aiming for 170f to take it off. 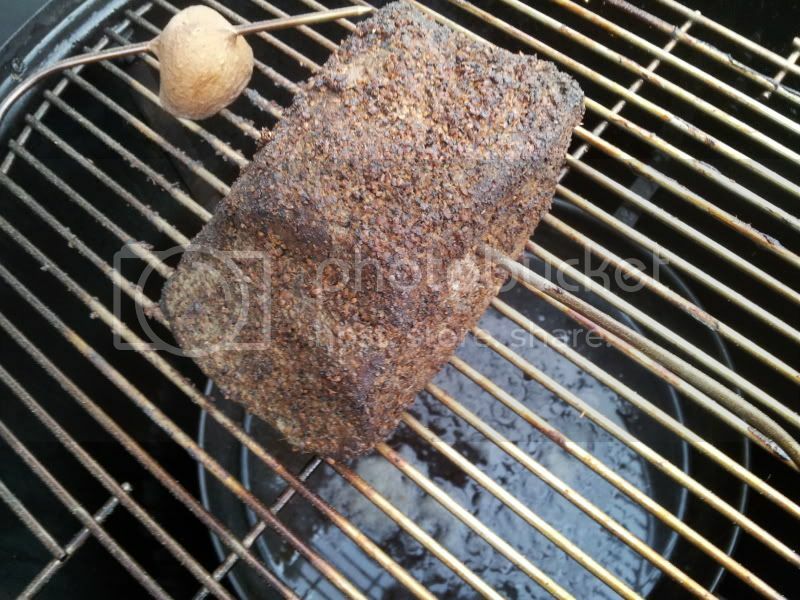 Not much danger in drying it out as pastrami is supposed to be a dry type of meat. It just stalled for ages and after 6hrs it was 163f and I took it off. Later that night it was carving time. I have a small meat slicer appliance and was going to use that but the longer thin piece of bacon wouldn’t fit and I find the rig a bit fiddly, not to mention a real pain to clean. So decided to just employ some knife skills with my nice new Wusthof santoku. Fried a piece of each to try and holy fark easily the nicest bacon ever. The smoking definitely took it to 11 as others have mentioned. No pic of cooked, was too keen to eat it! 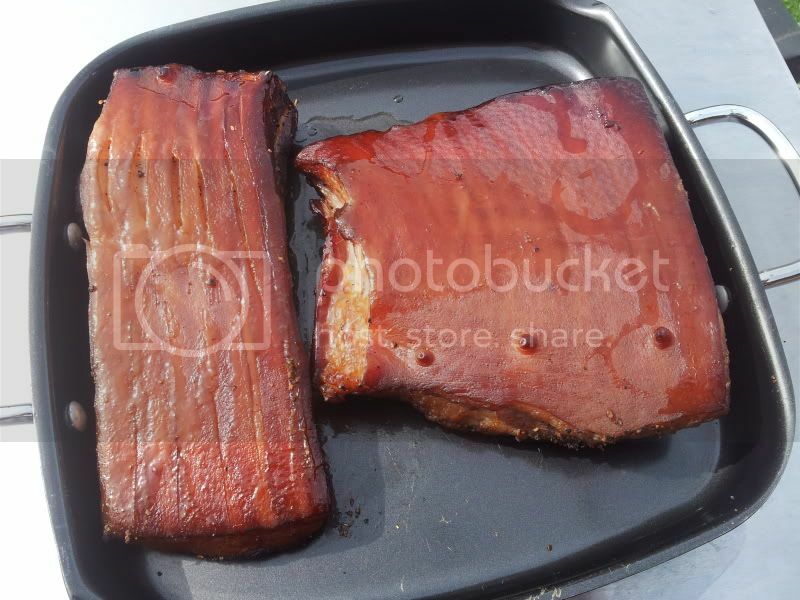 The flavour was awesome – smokey, sweet, salty, and the pork flavour really shone through. The non-frozen farmers market piece was a slight notch up on the other – could be the meat source, thickness, or frozen factor – hard to tell. 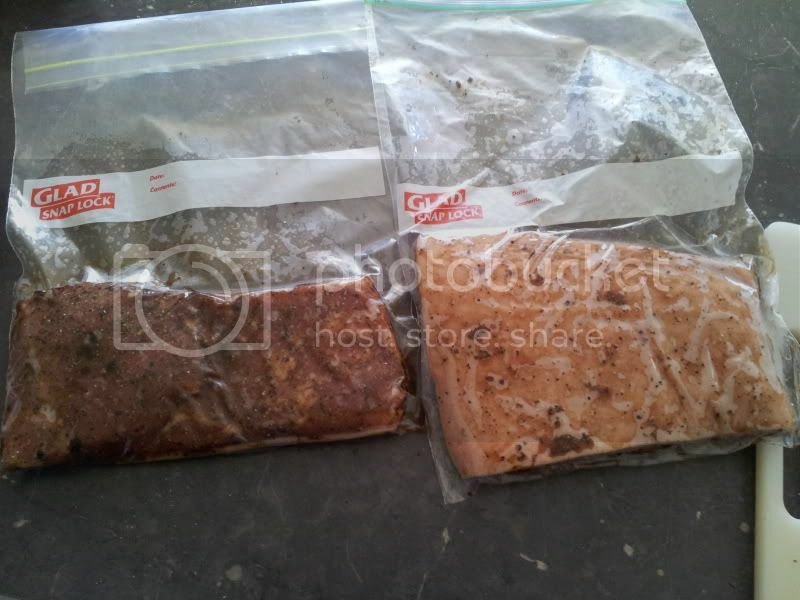 I then bagged up the slices in fives using glad snaplock bags. Protip: to get rid of as much air from the bag as possible and create a nice almost vacuum like seal, partially submerge the bag in a sink full of water and seal the last bit just above the water line. The water forces out almost all the air. Very nice! None of the corned beef flavour I hate, and just like the shop brought stuff only a stronger beef, smoke, and pepper flavours. Having some on a sandwich as I type and it’s very good. All up a successful mission and something I’ll definitely be doing again in the future. What are the laws exactly surrounding selling meat, even if to friends and family? I'm just curious for my own sake, would one need to get a food rating or anything like that?